We are currently celebrating over a half-century of service, with more than 16 years and 7.5 million man-hours with NO lost time incidents. 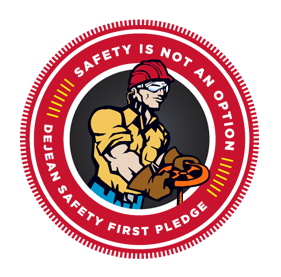 Safety is a Top Priority for all DeJean Companies. 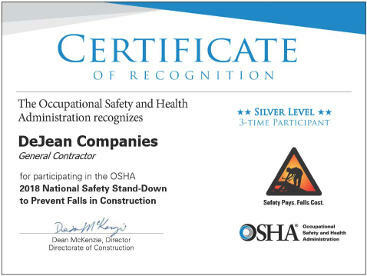 Our extensive formal written safety program is reviewed and updated on an annual basis by two professional organizations. Our program exceeds the requirements of MCMS, ISNetworld, Pics, Browse and Avetta. A confidential copy of the full version of our safety program can be obtained upon request. Additionally, our "Watch Your Buddy" program has proven to prevent many potential accidents. This proactive system extends to workers for the client or other contractors working in our area.